The well known HEX-editor for AMIGA computers. From the doc: - Several files can be modified in several windows and/or views at the same time. - The edit windows can be opened on any public screen and sized to any dimension you want. - Small calculator - Clipboard converter - Fontsensitivity - Locale support if you have OS 2.1 or higher. (English, Finnish, French, German, Swedish (Dutch, Norwegian (not yet included))) - Undo and Redo (only limited to your free memory) - Search and replace with history - Extensive blockfunctions - ARexxport with 77 commands and asynchronical command shell - Printing as hexdump - `Grab memory' to show and modify memory - AppWindow. 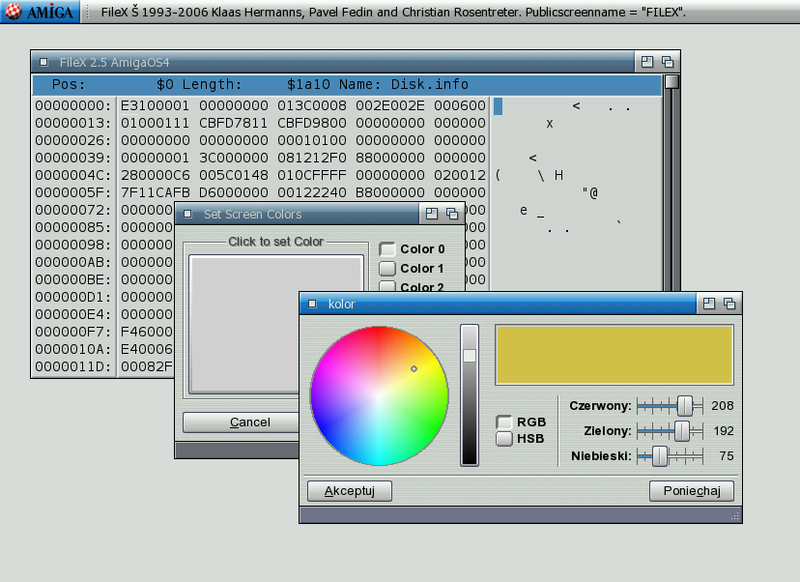 If FileX runs on the workbench, icons can be moved onto the FileX window and the related file will be loaded automatically. Created by Klaas Hermanns, Pavel Fedin, Christian Rosentreter, Alfred Faust.